Jodee Bock, Fargo, ND, USA | The Secretan Center, Inc.
Jodee Bock is principal and founder of Bock’s Office Transformational Consulting where she provides coaching, speaking, facilitation, development and delivery of customized workshops and seminars that support individuals and teams in succeeding at whatever they are committed to accomplishing. Jodee facilitates master mind groups, both in person and virtually, where people study and apply higher awareness and personal accountability into their work and home lives, beginning with the principles of the 1937 business classic, Think and Grow Rich. 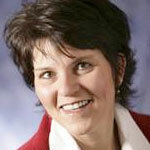 She is also the Team Leader for Keller Williams Realty in Fargo, North Dakota. Jodee is a certified master trainer and innovation coach for SolutionPeople in Chicago, and also holds several professional certifications including TWI’s Job Relations Training, Life Success Consulting and Life Purpose and Career Coaching. She is one of the founders of the Women’s Business Exchange, a Fargo-based networking and mentorship organization for businesswomen. She sings with an award-winning barbershop chorus in Minneapolis, and is a statistician for Concordia and NDSU basketball teams. She is author of the book The 100% Factor: Living Your Capacity and two blogs: You Already Know This Stuff and Riskful Thinking and a co-author of the books Inviting Dialogue: Inspiring Stories About the Power of the Master Mind and Don’t Miss Your Boat: Living Your Life With Purpose in the Real World. Jodee is also the host of the radio show Bigger Small Talk Radio.